Pain; it has a way of changing us. Sometimes for the best and sometimes for the worst. It all depends on which direction we choose to take. It’s human nature to avoid pain. Most times we wish it away, pretend it never happened. We create a make believe world full of what we perceive as happiness, “fake it till you make it” they say. So we walk around wearing masks and hide behind a facade. Oblivion is the new black. Wearing it to hide our true feelings. So hand me the mask would you? and let me dance to the fake parade. Let me dance to the tune of pretense. Where is my Neverland? The land that has no time, the land of possibilities. I call out to Peter Pan and he says,” You can fly away if you believe”. So call me Wendy, blow me the pixie dust and watch me fly away. Away from the abyss of pain and confusion. I’m now a lost boy running away from captain hook, also known as my feelings…running away from reality. I am happy, can’t you see? Watch me as I waltz to the tune of frustration, watch me as I dance with my prince charming, delusion. Welcome to the masquerade party. I am happy, can’t you see? Call me Cinderella as my time is almost up. I am about to change back. I am about to go back to a life of loneliness, the life I sink in. “How are you?” they ask, “I am quite fine, thank you” I answer as I walk on. Call me Pinocchio as my nose grows longer to the lies I want to believe. Even myself, I manage to deceive. Before I know it, here comes a storm and my masquerade mask gets blown away. The black cloud is getting bigger. I try to run but it’s catching up. It’s getting more fierce, I feel it clouding up my soul, numbing my heart. The wind blows on my frail body, the mask falls off. I look around, It’s bare. The masquerade party is over. I am naked, I am alone. I can no longer hide my face, my true self comes to the surface. Stop running! a voice says to me. I stop on my tracks, I fall apart. I’m lying in a puddle of my tears. How did I get to this. I was fine, wasn’t I? until the unwanted visitor paid me a visit. He reminds me that neverland was never a land, the masquerade party was all in my head. Welcome to reality dear one, where emptiness chains your legs and melancholy ties your hands to your back and dancing to the tune of life is but a rumour. I now stand before you, bare and unashamed. I no longer want you to see perfection but cracks that bring out the light in me. I am extraordinary because I refuse to hide, I refuse the invite to the masquerade party. I want to be whole again but before that happens, I need to admit that I am flawed. That I have this heinous parasitic monster that lives within me,that sometimes drains the life out of me and blows me around like a plastic bag. Yes, I have depression, depression doesn’t have me. I am not depression. Are you depressed too? Are you fighting a mental illness? My dear, you’re not alone. If anything, I’m right by your side with my blog. This blog was meant for you. 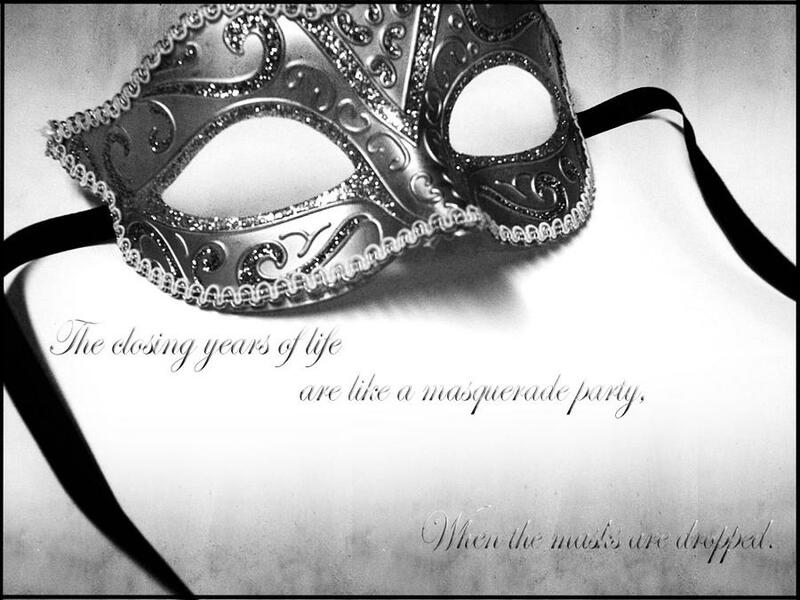 Don’t give up yet, don’t join in life’s masquerade party, where people wear masks of pretense. Let down your mask,Show yourself and proudly be yourself. Admitting this to my friends or even to myself was and still is the hardest thing for me. People don’t get it. They think it’s just sadness. Sadness that you can decide not to feel. They don’t get how the melancholy sneaks up on you like a thief in the night. They don’t get the crying fits that attack you like a suicide bomber on a terrorist mission. How your heart breaks into a trillion pieces and your pain is inconsolable. How you really want to be in control but it’s like combating a faceless enemy as a blind soldier; you’re surrounded by darkness and cannot even see what you’re fighting. I get it, I do. It scares me to death that people will find out that I’m a fraud. That beneath the happy-go-lucky, turn up girl seen on the surface, is a hollowness that runs deep. I am scared of people finding out that I don’t have the answers to my own emotional turmoil and tribulations. I am ready to let out the secret that I am flawed and damn proud of myself for coming to terms with it. I am taking off my mask. Take off yours too. I’ll conclude by quoting advice given to me by a very good friend of mine, “Running away from your emotions is like sweeping dirt under the carpet to make your house look tidy but eventually the dirt resurfaces. What you run away from will always catch up with you. Don’t run, deal. First things first, Change your mindset from “I am broken and helpless” to “I am growing and learning”….